The way Royal Caribbean keeps adding China, they should have enough place settings now for everyone in Miami. The line said today that in 2015 they would be adding another Chinese home port and an office to support. 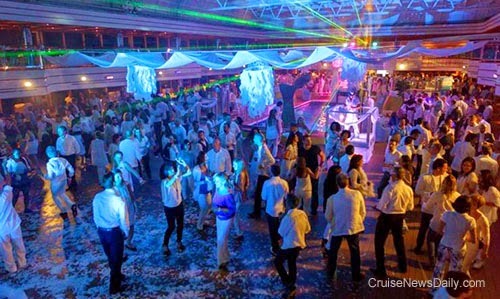 If white is cool, than Costa ships will be almost frozen this summer as they celebrate “La Notte Bianca” on every cruise through July. A traditional Italian celebration to mark the beginning of summer, “The White Night” will be much more than just the night on Costa ships in the Mediterranean and Northern Europe. A passenger went overboard from MSC Divina Wednesday afternoon as the ship sailed off the coast of Brazil. Usually we are writing about the German cruise industry being on the cutting edge, so this item may seem rather strange to our American readers. In America we are used to guide dogs and other service animals going everywhere. It’s actually mandated by law and expanded to include all sorts of service animals - various types (not just dogs) performing a multitude of tasks for those who are differently-abled. So it comes as something of a surprise that we are reporting that last month Carnival’s German brand, AIDA says they carried their first guide dog. A couple of weeks ago, we told you about the nine new single staterooms built aboard Queen Elizabeth (the ship). Today Cunard unveiled the rest of the multi-million-dollar refurbishment aboard the four-year-old vessel in the new video below. For the first time last year, more than one million passengers boarded cruise ships at British ports, 1,062,000 to be more precise, which represented a whopping 8% increase over 2012. With them, the cruise industry brought cash, both in direct spending and in the form of a sizable economic impact. On Friday night, the Port of Los Angeles will open up a new area of the LA Waterfront, Downtown Harbor and Town Square. It connects downtown San Pedro to the LA Waterfront. A short video is below. Next week, the date will be set when Costa Concordia will be refloated and towed to a salvage yard for dismantling. The Italian body that is overseeing the project (and thus required to give its approval every step of the way) will conclude their meetings on June 26 and announce the final plans (assuming they approve). The new Downtown Harbor and Town Square ares of LA Waterfront are opening Friday at the Port of Los Angeles. This video gives an overview of the project. The SS United States will sit rusting in its Philadelphia berth for a while longer, thanks to the generosity of another donor. The hope is that during that time, before the money runs out to store her, the owners (the Conservancy) will find someone who wants the ship, has a place for her, and the money to restore and repurpose her. MSC has a new video commercial spot. It’s interesting in that on the surface it’s slightly humorous, but it sets you to thinking, perhaps on a deeper level. Jamaica is beginning to lose cruise ship calls, and the opposition party in Parliament is beginning to take notice. The cruise industry must have one of the flimsier glass ceilings in the business world, because come this fall, another cruise line will be headed up by a woman. TUI Cruises announced today that Wybcke Meier will become the CEO of the line effective October 1, replacing Richard Vogel, who announced last week he would be leaving the company.